Last month, I went to the Content Marketing Instititute’s Intelligent Content Conference, a three-day event geared at addressing the obstacles companies face dealing with large scale content. Three days in the Nevada desert filled with good food, like-minds, and tons of learning leaves your brain and stomach digesting for quite some time. Okay, so what’d you learn? 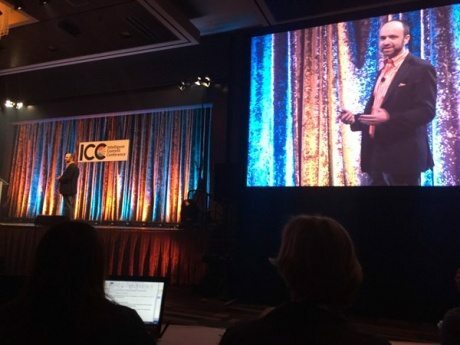 Since ICC was really geared towards helping large scale organizations with existing content strategies, my first task was to translate that into something I can take back to my clients. I was happy to find some main themes focused on sharpening our abilities to think strategically about our content and the paradigm shift of content as an important business asset rather than a project. These ideas are scalable to companies of any size with any level of content. So let’s talk about this recurring theme of being strategic in our content efforts. The heart of the challenge is this: we’re creating more content than ever, yet we’re seeing engagement nosedive. We’re filling this sea of noise faster than ever, while our audiences are building up walls against us at a similar pace. The speakers call on us (marketers) to be agents of change and shift this paradigm. In the conference’s opening keynote, Robert Rose, calls us out for being so busy feeding the monster with more content we forget to look up at where we’re going and why we’re going there. By starting with strategic practices, persona development, customer journey mapping, and content audits, we will not only create better content that people are actually engaged with, but we’ll also become more efficient at doing so. Robert leaves us with the parting advice, “Look up, find your road – and pave it consciously”. So how do we strategy? Clearly this isn’t something that can be done justice in a sub 1000 word blog article, but let’s touch on some of the high level components to a strategic and intelligent approach to content marketing. Because understanding your audience is possibly the most important piece to building a solid strategy, we need to look at how we build those personas and how we actually use them. Ardath Albee led a great session on this particular subject. When you’re beginning your persona discovery, you need to be looking for information that is truly relevant to your goals and will help inform your strategy. This takes some finesse. Just sending a questionnaire out to a bunch of existing clients will fall short… persona study interviews need to be conversations, not interrogations. As you build your personas and start to really lay out what your buyer’s journey looks like, you can start to be strategic in how you plan your content. Mapping your content to the key interactions your user has with your brand is the key to creating relevant and engaging content. Ideally, your audience should be informed with each question they have, every step of the way. Mapping your content to their journey is how you make sure that happens. As you match content types to steps in your user’s journey, you can start to build some strategy behind your content creation as well. One of the best tips I got at this conference was about looking at your content as modules rather than just a simple long form piece. By creating your content in components, you’re able to break each piece out in different iterations to be used across many channels and steps in your user’s journey. A customer journey model is one component to building your strategy, but there are even more models to be made. Andrea Ames, IBM’s Enterprise Content Experiences Strategist, explains how content models are our secret sauce in another amazing keynote presentation. Modeling customer and prospect behavior can be incredibly effective at increasing efficiency and consistency while still leaving room for creativity. In our content strategy, models will help inform our creators what content is needed, why it’s needed, and where and how it’s delivered. The models in your content will take many forms, and there will likely be models inside of models… like model-ception. For example, inside of your “customer experience model” you will likely have a user journey model, a content type model, and an access model. The key differentiator in most successful content marketing campaigns lies within the documentation. According to a study by the Content Marketing Institute, marketers with documented strategies were more likely to feel effective in their efforts and were able to justify a higher portion of the budget towards content marketing. The components that we’ve covered here become even more effective when brought together in a well documented content strategy. Matthew Grocki‘s session on how to document and refine your content strategy shed light on the key components and process. There’s no magical template that works for every organization – the level of documentation will depend on your business, your strategy, and your needs. Remember, documenting your strategy is important for not only providing a guideline for consistency, but also giving a metric for success. I know… I’m recapping what I learned about at this conference focusing on the technology we use in content marketing but I didn’t mention a single piece of software. One of the biggest takeaways from Kate Kenyon was that technology is not THE answer for your strategy, it’s JUST the conduit. I hope this article has helped give some insight into the importance of building a strategy behind your content marketing. I’m sure it’s given you a handful of questions at the least. Because each of these pieces of the content marketing strategy puzzle deserves so much more than a brief paragraph, I’ll be spending some time unpacking each of them in a few follow up articles. In the meantime, if you have any questions, other key takeaways, or more conference insights, please share them in the comment!